August 17, 2018: Show #261: This could get ugly. It's just after 11:00 AM in music city. How can I be in two places at once when I'm not anywhere at all? Like the pronunciation of "Nashville"
Thinking the same thing, Henry -- "Naishville". Whew, I feared they pulled your clearance! This is a great day NOW! Yay UM! Well, Amazing Grace did come, but not for me. Fire alarm ushered us out of the building during that last of Doug's sets. What does this portend? Rich! Doug! Henry! Parq! Wino! Roberto! Does this song translate to English as "I do not want Tofurkey" ? Comedian Harmonists make my heart swell. In a good way. 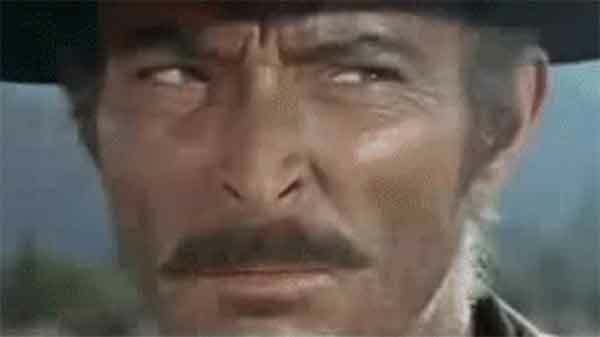 Lee Van Cleef makes my Friday! I watched an interview with Linda a couple weeks ago. She was lovely, just as Paul wrote. This song always creeped me out as a kid. Hah- I woke up this morning with "Cool Water" on my mind, and I always associate it with Uncle Michael. But now I'm a man. I can handle it, pretty much. What I never could figure out: is "Dan" a guy he's travelling with, or his horse? I think Dan is the Horse! The Turtles sing etcetera on Eleanore. Afternoon all! For whatever reason they had us sing "Cool Water" in fourth grade. I always thought Dan was an odd name for a horse, but I did enjoy singing about a guy dying of thirst. Sparks sounding oddly like Togawa Jun. These last two tracks, political commentary? so was that cool water the same cool water that Hank sang? (in which case i'm sorry i missed it, even though it must pale in comparison) ? I don't know that there's any other Cool Water. OK. I went for my walk and was hearing that awesome Osmonds track, which I woulda never guessed was them..
and I have that record. I obviously haven't listened to much of it. I think there's a slightly different version of Cool Water. My dad used to play some kind of Best of record by them often when I was a tadpole and I recall the version I remember as sounding just slightly different (cursed with a weird phonographic memory). seems like a song title that would get around. i'd bet there's at least one other song named "cool water"
Rich, I'm pretty sure the Sons recorded it several times. Hank recorded it once, that i know of, but there's a version with guitar overdubs that sounds pretty different than the bare version. I am sure you are right. I have this weird OCD-ish thing about versions of songs, which is often fouled by the fact that artists would often record different versions of their songs for different labels, etc. I get somewhat particular about a certain recording. Rich, i can relate. even if i don't like a version, i'm interested to hear it. i will always (almost always) have a favorite though. I need to go - good to catch part of your show UM! It's funny how that is more of a thing with music in the 40s/50s/early 60s but after that, it's somewhat rare-ish for an artist to record different versions of the same song. Been enjoying the show in the car (much better way to listen than at work, but usually don't have the luxury ). Shopping stop next! OMG! A real Reuben! They're incredibly hard to find where I live. What kind of dressing, UM? I am particularly proud of my skillet steaks. It took me years of bland, grey steaks before I stumbled on how to do it right. I almost prefer them to my barbeque grill steaks..
mayo, a little ketchup, a little relish, a bit of horseradish. Nice! I don't think I've ever tried horseradish on a reuben before. I've almost entirely transitioned to steaks in an iron skillet, preheated in the oven. I only see corned beef at supermarkets around here around St. Patty's day, and then, it doesn't look very good. I just recently read about that preheat method but I haven't tried it yet. Worth it? Hey Unc! Nice Strawbs cut! No wasted corned beef...the end that's not happily sliced becomes hash...red flannel hash. I used to eat tongue tacos at my favorite taco stand, but had an undercooked one and it grossed me out to no end and I also once read that beef tongue is one of those mad cow high risk meats, especially if undercooked - so now I can't eat them. I've had tripe tacos and in menudo, but it's not my cup of tea. Also in pho. No pho king way. VP! Wondered if the Strawbs would draw you out. Way worth it, Rich...much better Maillard effect. The same taco stand has cabeza, beef brains, but I can't do it. New thing with steaks is marinating in shio koji. Google it. Cabeza is not beef brains. It's the meat around the skull. Sesos are brains. I've had un taco con sesos at King Taco in South Central LA. Was yummy. Thanks Dean! I just assumed, given my rough Spanish. Isn't that also what constitutes headcheese? I think so, but given my rough Swiss, I don't know for sure. my headcheese is full of holes. octopus tacos are the best. Got up for a second, only to return to SHOOOOOOOBY!!! Shooby was a compelling demonstration that "follow your dreams no matter what people say" isn't always good advice. There was a somewhat expansive issue of the original Human Horn collection recently. I am sure Irwin was involved. just on my way out to work and had to turn around and find out what the hell this song is (Shooby Taylor)! Terrific!!! -off to lunch in a bit, thanks UM! Wouldn't it be funny as hell if Shooby Taylor was in actuality Cecil Taylor pulling our legs. Oh God, please make it so. ... a´nd Ventures' "New Testament" is surprisingly good. Digging this "Creepy Loners" set. Rutles! This album is such an overlooked gem. New Rochelle, I can't hear you! damn, this is sooo nice.. I've been to Dubuque! I like the Mississippi River museum. Thanks Uncle. Good weekend everybody. Show went down easy. Thanks, @UM. thanks everyone..see you next week. I like your show better with electricity.